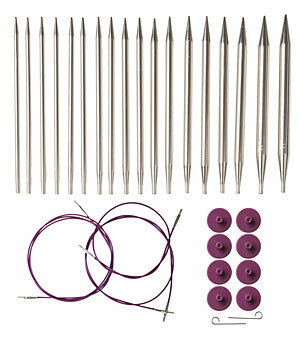 Once you have learned to knit, and you know you love it, you should really consider a needle set. You will be buying a new needle or two for every project for the rest of your days knitting, and at $5 – $25 per pair/set of needles, you are going to be in deep over the course of a life of knitting. Here, I will review three of the major sets on the market. Recently, I had the chance to road test two other sets of interchangeable needles. First, I tried the Knit Picks Harmony Wood Circular Set. These needles are very beautiful. They are brightly colored, striped wood. The needles themselves are well made. But while they are very pretty, it makes them a little bit harder to knit with. especially if you are using a color that is close to one of the colors in the wood. This would be even harder if you were a beginner, and needed to look at your stitches a lot. Or, if you were doing lace and you needed to look down at what you were doing a lot. The joins are perfect in this set. They are absolutely smooth and undetectable. 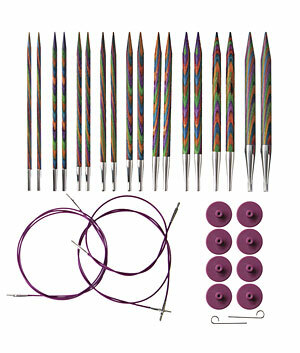 This set runs $84.99, and offers 4-11 with the option of buying bigger tips separately.On these needles, the tips are surprisingly sharp. That is good or bad depending on what you like and what you are knitting, but they are sharp to be sure. The other set that I tried out was the nickle plated interchangeable set also from Knit Picks. Swish! These are light and beautiful. The joins are smooth. And the tips are not quite as sharp (so that was a little easier for me). This set is 69.99. The needles are 4 – 11, with the option to add bigger ones. I personally love wooden needles. So I would consider getting the Sun Struck needle set. Blonde wood be easier for me. But the question for me is going to be how sharp are these needles? And I LOVE the nickle plated as well. So maybe it is a toss up. Do you have a set of needles? What kind are they? Do you like them? 6 years ago by Susi in Knitting , Needlecraft , Reviews , Tools | You can follow any responses to this entry through the RSS feed. You can leave a response, or trackback from your own site. I’ve only ever used the Denise ones. I’ve been pretty happy with them, but have had some of the ends break off the cords where they insert into the needles. I contacted Denise and they were great sending me free replacements right away (apparently, they had had a bad batch at the time). I’ve never had a problem since. What are the Denise needles made from? Ros, The Denise Needles are a gray plastic. 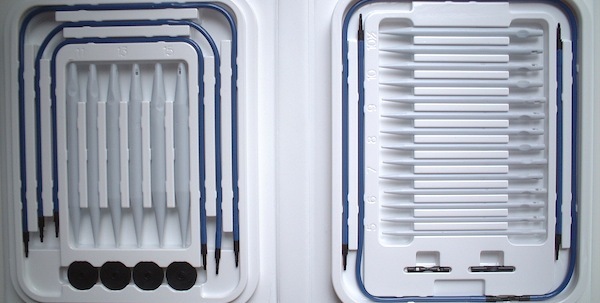 I have a set of the Addi Turbo interchangeable needles. I LOVE them!! I am hoping for a set of the Addi Clicks for Mother’s Day this year, doubt if they remember but then birthday is not long after! LOL. 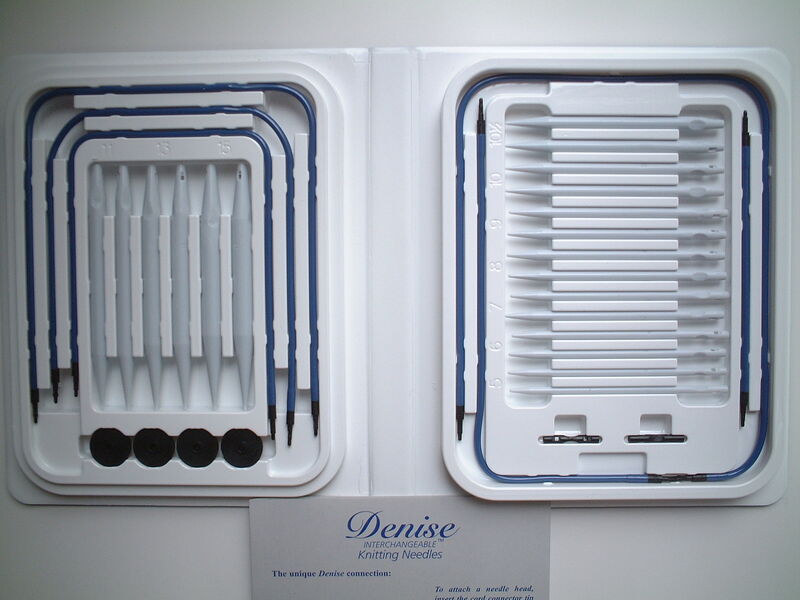 I have not tried the Denise but have heard many great things about them. I have used bamboo but found they grabbed the yarn too much for my liking. I do have some larger size in the Lantern Moon that I received as gifts, they are very nice also. I started out with a set of the Boyle interchangeable, but they kept coming apart while I knitted, so I gifted to someone that wanted them. Oh, a set of Addi Turbo interchangeables is my dream!